We deliver self storage to you! Central Storage is proud to offer our customers the highest convenience of On The Go Portable Storage. 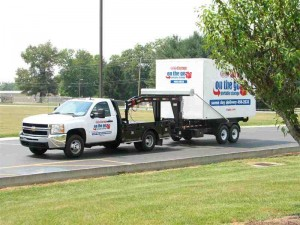 Each 8 feet by 14 feet (112 square feet) mobile storage container is delivered right to your door and placed at a predetermined location on your property. Load your items into the container at your own pace, and we will pick it up and bring it back to our storage facility. It will be kept secure within the gates of our property, and when you are ready for your items we will bring it back. You can rely on Central Storage, the Upper Cumberland’s Storage Solution. Call us at (931) 456-2533 to schedule a delivery.